At API Pneumatic UK, we have an extensive range of pneumatic solenoid valves available. Choose from our A1 series of pneumatic spool valves, or take a look at our ISO 5599/1 conforming pneumatic valves. If you are unsure about the size or type of pneumatic valve you require, our technical team is on hand to answer your queries and advise on the correct API pneumatic valve for your system. The A1 series of pneumatic solenoid valves are available in an extensive array of sizes and types to suit the specific needs of your application. Each of these pneumatic spool valves are in stock and available to buy on a next day delivery basis from API pneumatic UK. Our A1 series pneumatic spool valves are manufactured for either panel or sub base mounting, depending on the requirements of your application. 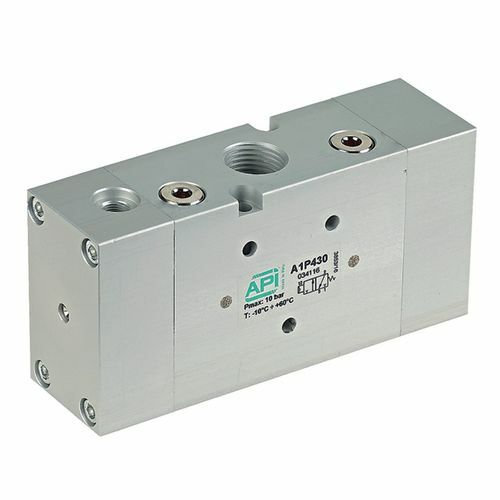 These API pneumatic valves are high flow and manufactured with static seals. Our pneumatic spool valves accommodate your application’s demands through multiple versions. Whether you require pilot/pilot or a spool valve with a pressurised centre, API can provide the solution. Each of our pneumatic solenoid valves in the A1 series is designed for use with compressed air, with or without lubrication and function to the highest standard in a temperature range of -10°C to 60°C. For specific technical information about the flow, pressure ranges and orifice size, please take a look at the API datasheets for each specific type of A1 pneumatic spool valves. Another type of pneumatic valve available from API Pneumatic UK is the ISO range of 5/2 -5/3 pneumatic spool valves. Our ISO pneumatic valves are designed to conform to ISO 5599/1 and for use with compressed air, with or without lubrication. They are manufactured for sub base mounting only but come in an array of versions to adapt to your application’s requirements. This includes with closed, pressurised or open centres. Our ISO pneumatic spool valves are suitable for use in a temperature range of -10°C to 60°C and a pressure range of 0 -10 bar to ensure they perform to the highest standard. For more information about orifice size, flow, minimum piloting pressure and manual override, take a look at the technical datasheet for this specific product. Why waste money on expensive downtime? Order from API pneumatic UK and have your pneumatic solenoid valve with you the very next day. We hope to accommodate all of your requirements. Therefore, we also have pneumatic solenoid valves that meet ATEX standards available on request. 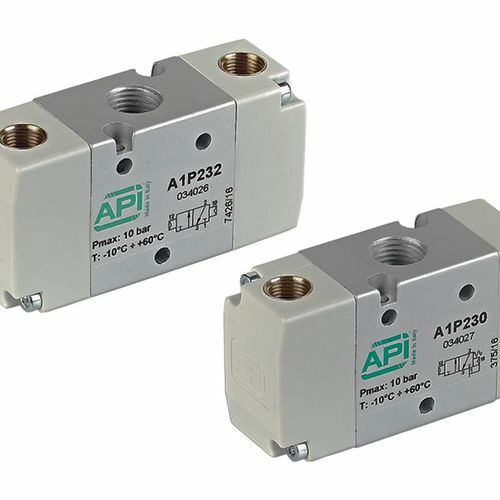 For more information about our pneumatic solenoid valves, contact the API technical team today by calling 01782 206 995 or emailing sales@apiuk.co.uk.